Formula1. Terminal 3 (T3) at Changi. Integrated Resorts (IR). Big things are happening in a small country. These three economic drivers in Singapore can change the way we do business within our industry. It can be the Big Switch for us. But first, let’s take a glance at the scale of change within each. Having won the rights to host a first ever night Grand Prix for the next five years, the government is all set to have the event & it’s city state, publicized across the world. Read the Reuters article for more details about the same. T3 promises to change the globe trotters travel experience, with its 5 storey high, vertical “Green Wall” garden, 70 Retail & Shopping stores and 30 F&B outlets. Besides this, the automated ‘Baggage Sortation System’ and 9 storey airport hotel promise to transform Changi into the foremost among Airports. With people spoilt for choice in goods, products and services, not only marketers, but even tourism boards vie with each other to capture the attention and wallet of the consumer-traveler. Within Asia, we have centers of pulsating change : The Shanghai’s face lift, the upcoming new West Kowloon cultural centre in Hong Kong, Integrated resorts in Khao Lak, Thailand, and Formula one and the KLCC project in Malaysia. 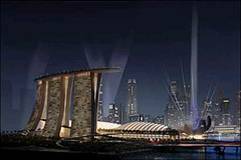 Shedding a few inhibitions, Singapore is aggressively launching its two Integrated Resorts at Marina Bay and Sentosa. These will convert 57 hectares of land into an offering of Theme Parks, Resorts, Hotels, Restaurants, Shopping malls, convention & exhibition space, museums, theatres and casinos. It will feed the tourism revenues with about 35,000 jobs in the hospitality sector: Retail, Exhibition, Hotel, F&B and Aviation. For more details on the IR read Prime Minister Lee Hsien Loong’s speech in Parliament. It’s impossible not to get effected by this change. There is an urgent need to establish our stance within the “Business” in Communication & Media. Retail, Content & Films and Sports Partnerships will thrive. They are expected to. Pertinent is the ‘scale’ on which we do business that will make all the difference. If the fields of competition are open to all, and this is where the consumer is going to be, we should be in the race. Entry filed under: outdoor, singapore, trends. Combine all that you have said and to add to that Singapore will be one of the most broadband enabled markets in the world , a flourishing retail destination…all this means that we get a crucible to test some of our very latest consumer connect models….